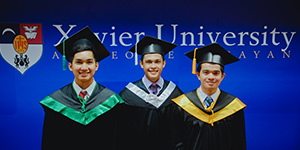 The Xavier University-Ateneo de Cagayan Alumni Association (XU-AAA), an association of XU-AdC graduates, is a non-profit, non-stock organization whose aim is to promote the welfare of its members and that of its Alma Mater. The association organizes social events and raises funds for scholarships and for the organization. It helps alumni maintain connections to their alma mater and to fellow graduates. To prepare the XU-AAA, Inc., administratively and operationally of the gargantuan tasks that it commits to undertake in the short, medium and long term. To strengthen the relationship by and between the XU-AAA, Inc., and the University. To undertake programs, projects and activities to help the alumni. To undertake programs, projects and activities for the less privileged. To actively participate in the development efforts of the city and the island, in general. Undertake resource generation activities to fund the various activities of XU-AAA, Inc.